GreenBlu's stand-alone module deployed with solar collectors is said to generate 16000 gal/day using a 5000 ft2 footprint. 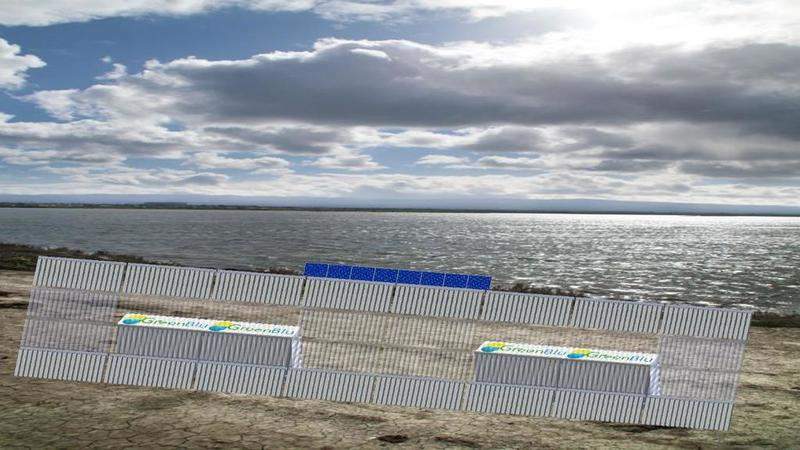 Credit: GreenBlu, Inc.
US-based water technology company GreenBlu has initiated an award from the US Department of Energy’s Solar Energy Technologies Office (SETO) to commercialise its new thermal distillation technology. The $1.6m grant will be used to advance the new Vapor Adsorption Distillation with Energy Recycling (VADER) technology. GreenBlu intends to develop a prototype of the commercial product. VADER leverages a nanocomposite adsorbent to boost energy efficiency and overcome the top brine limit. It is also said to facilitate zero-liquid-discharge (ZLD) desalination and water treatment. The firm noted that the desalination technology is designed to recycle latent adsorption energy and is calculated to significantly decrease electricity consumption as well as triple thermal energy efficiency. GreenBlu plans to use the technology to reduce the cost of zero-carbon desalination, ZLD wastewater treatment and seawater mineral recovery. Existing desalination methods are completely electrically-powered or utilise both electricity and thermal energy. Such techniques are said to be expensive, have carbon emissions and discharge brine. GreenBlu expects that its carbon-free, heat-powered and grid-independent desalination products will offer an alternative for the current methods. The new VADER desalination technology can be used for a distributed desalination network, to increase output from existing facilities and offer sustainable magnesium. The product is said to have the capability of recovering magnesium chloride and sodium chloride salts from seawater as well as waste brine.